How much did your last miss-hire cost you? Perhaps the question is, who do you use to reduce your risk? If you were recruiting a sales-team today, would you recruit the staff you currently have? 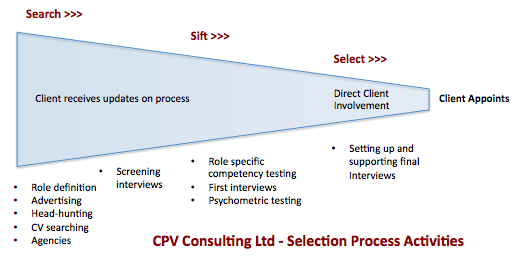 When you are recruiting new sales staff, how confidently do you approach the process? The key to successful recruitment is actually to have a process, and then to stick to it (no matter who walks through the door). Since no two sales roles are the same. Taking time at the start of the process to define precisely what you need your new hire to do, is critical. If you have ever hired an account manager to generate new business for you, you’ll know just how easy it is to put a square peg in a round hole (and how hard it is to subsequently manage them). From the role definition should come clearly defined shortlisting criteria. If you need someone to perform a field sales role, then make sure your candidates all can evidence successful experience in a field selling role. Without a role based track-record, you are moving into the area of belief… Belief that the candidate when in role, can suddenly deliver the role you need performing. Is that a risk you really want to take? Our next observation is that most companies hire sales staff without checking that they can actually perform the basic task of selling. Top performers can not just show you how they perform the task, they can explain the steps they are using, and show some flexibility around how they take them. The short answer on interviewing is to avoid allowing the candidate to give a practised verbatim chronological description of their career to date. Ask them challenging questions. Wait and watch for how easily the answers come. The process is not about brow-beating the candidate, it is about trying to understand what makes them tick, and what they can bring to your business (remember, you are not recruiting a personal friend, you are recruiting a sales resource to deliver for your business). By the time you get to final interviews, you should already have enough information to make an informed decision. We are constantly flabbergasted at the poor technical sales skills demonstrated to us at interview stage, from experienced sellers (who’d we’d expect better from). Better to pick up on development areas prior to hiring, than afterwards. The question then moves to “can this candidate give us examples where they have learned new skills”, in which case it’s just a learning need. If not, it’s a potential “disaster” hire, as in candidate can’t perform the key task, can’t learn how to do it either. Give us a call to share with us your recruitment headaches. Of course, we’ll be delighted to help you, though kicking ideas around over the phone is usually a great starting place.